Editor's Note: This post is authored by Rita Dorry and Andie Cozzarelli of the Raleigh Distance Project. 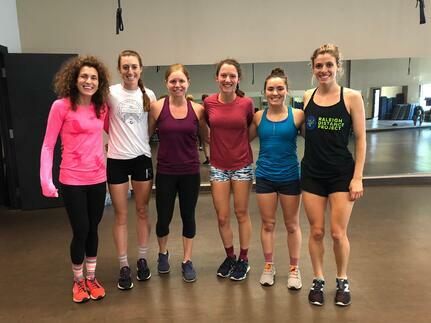 Andie is a semi-professional distance runner for Oiselle (Haute Volee Elite Athlete), Jasyoga, InsideTracker, and Generation UCAN. In 2015, Andie set big PR’s in the half marathon (1:12:50) to qualify for the 2016 US Olympic Trials Marathon. In 2016 she also won her debut marathon at the Indy Monumental Marathon in a time of 2:38:47. Rita is a former collegiate baller who left the sport after an injury and turned to running. With a preference for long distance, Rita has won several local races and is focusing on the marathon with a goal of qualifying for the US Olympic Trials Marathon in 2020. Thirty minutes of total core work that makes you feel instantly accomplished. As runners, we absolutely LOVE it because we need strong cores to run fast and prevent injuries. However, when we say core, we don’t just mean having a rock hard six-pack. CXWORX targets your entire core which includes: glutes, shoulders, upper back, lower back, obliques, lower abs, and upper abs. A strong transverse abdominis (lower abs) protects the lower back and allows one to use their glutes more efficiently. Glutes are the powerhouse of a runner’s stride so we need these to be strong and engaged in order to have endurance and prevent injuries from incorrect form. Runners also need to have strong upper backs and shoulders to keep the chest open and the upper body stable because we don’t want to restrict the breath or waste energy twisting our upper body. Regardless of whether or not you run, a strong core is essential for keeping your body healthy and happy. It is amazing how often we rely on our core to do normal everyday tasks - from picking up boxes without compromising the back, to sitting down without sliding out of the chair, and even to getting out of bed in the morning. We need our core. CXWORX checks all of the boxes for us. As long distance runners, we do enough cardio outside of O2 Fitness so stepping into a CXWORX class doesn’t add additional cardio. It challenges us and makes us feel stronger. It is low impact, using only exercise bands and light weight plates, 2.5 - 10 lbs max. It is also short. With all of us working other jobs, CXWORX is easy to fit into our schedules giving us the most bang for our buck. Thirty minutes packs six tracks of focused core work and more than just crunches are involved. We do planks, lunges, glute bridges, rows, and the list goes on. Going to the gym can sometimes be intimidating or mundane when we don’t have a plan. Trying to think up our own exercises never quite hits the spot so we prefer to take away the thinking and just pop in a class. Fit it in on your lunch break or join in on your way home from work. You could even sleep in on a Saturday and join us at 10:30 a.m. at Seaboard Station in downtown Raleigh! No matter when you do it, we recommend saving just 30 min of your day, a couple times a week, to devote to CXWORX. Your body will thank you! 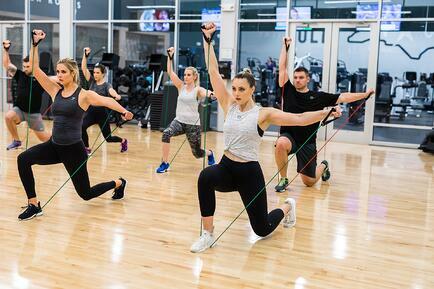 Check the Group Fitness class schedule at the O2 Fitness nearest you for all CXWORX classes!